Hillsboro Beach Florida is a small and very exclusive town by the beach. There is no public beach access – not that I can find anyway. If there is then it must be secretly hidden from the public’s view. No bother – there’s plenty of sand and sea space everywhere else along the coast. It was, however, a real treat looking at all the luxurious homes that lined the road, professionally landscaped and complete with large statues, bougainvillea vines and colorful bromeliads. Ahhh! This is the life! A1A was shaded from all the foliage and super-sized mansions as we rode by, completely enjoying the movie passing before us through the windshield. Dodging the occasional biker or runner, we weaved the narrowed passage heading south. Hillsboro Beach Florida actually sits on a peninsula, bordered by Deerfield Beach to the north, Pompano Beach to the south and nicely wedged between the Intercoastal waterway on its east side and the Atlantic Ocean on its western shore. 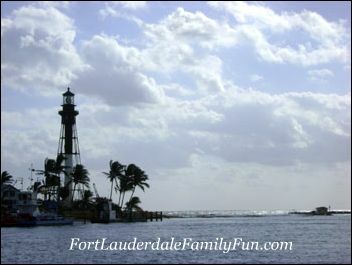 It’s probably best known for the Hillsboro Lighthouse that indicates the northern end of the Florida Reef. The lighthouse beams the most powerful light on the east coast of the United States. You can't just go up the lighthouse but there are special tour dates when you can go. These dates are listed in the Hillsboro Lighthouse Preservation Society at www.hillsborolighthouse.org. 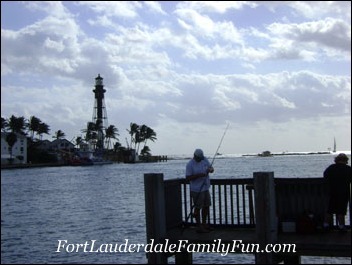 To get a good view of the lighthouse, cross over the Intracoastal to the City of Pompano Beach. Just right after the bridge is the small and cozy Hillsboro Inlet Park. There were a couple of morning fishing enthusiasts patiently waiting for their catch. There were a few boats already in the inlet and eventually going out to the wider ocean. Time to move onwards to the more popular beaches in the area.